The continuing increase in the quantity of new vehicles on the world’s roads, combined with the need to reduce accidents and the limitations posed by traffic congestion, creates a challenge for transportation and highway authorities as they seek to maintain and upgrade their communications infrastructure to ensure the highest level of service and safety for drivers. Highway authorities require a unique mix of communications services to enable the effective management of roadway control systems, CCTV cameras, payment gates, traffic light control systems, as well as mobile connectivity between operational and security staff and the highway command center. An additional challenge is the need to deliver voice, data, video, telemetry, and other traffic using a wide variety of interfaces, network infrastructure and technology generations. Above all, given the critical nature of highway infrastucture, the communications element that accompanies it must ensure reliable and secure operations at all times. RAD’s field-proven Service Assured Networking (SAN) solutions have been widely deployed along highways in rural and urban areas to enable robust communications using different backbone solutions. These include RAD’s Megaplex, a high-capacity multiservice networking platform, the ETX Carrier Ethernet service aggregation platform and PacketLight’s WDM/OTN platform, which features integrated encryption. The access solution is based on RAD’s SecFlow family of ruggedized security switches/routers and its Airmux sub- 6GHz high-capacity radios. SAN is fully monitored and managed by the RADview Network Management System. Together, these security-by-design solutions support highway multiservice connectivity, automation device backhauling (CCTV and information boards), wireless mobility (for staff operated vehicles), and high capacity operational networks, while enabling future capacity expansion to meet the highway’s evolving needs. Megaplex features legacy interfaces (for serial data and legacy voice, among other possibilities) for connectivity of different existing operational devices, together with other IP services, such as voice and video, using standard industry interfaces. It efficiently transports traffic over copper, fiber, microwave, or satellite links, using a ruggedized enclosure specifically built to withstand the rigors of field operations with built-in PoE functionality for powering CCTV cameras. Megaplex supports fail-safe operations with TDM and Ethernet backup, and its hybrid TDM and Ethernet architecture ensures smooth, costeffective migration to next-generation packet-switched networks. In addition, Megaplex allows future applications and functions to be added as needed, using a field-pluggable x86 server. It is strategically designed to provide highway cyber security and features a wide range of advanced protection mechanisms, including authorizaiton, authentication, encryption, firewall, and anomaly detection, among others. PacketLight’s product suite offers the flexibility to build a highly efficient, cost-effective optical network infrastructure for CWDM/DWDM, OTN and dark fiber connectivity while addressing challenges faced by the growing capacity needs of highway authorities and other operators. 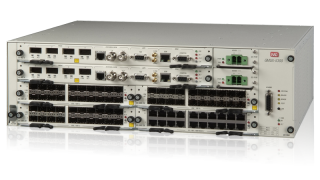 The wide range of PacketLight xWDM and dark fiber solutions includes multirate sub-10G CWDM/DWDM platforms, 10G CWDM/DWDM and 100G solutions with built-in OTN options and passive multiplexing with integrated end-to-end physical layer encryption. RAD’s compact SecFlow family integrates multiservice functionalities with built-in security mechanisms designed specifically for protecting mission-critical operations from man-in-the-middle attacks. Like the Megaplex, these devices support IP and Ethernet communicatons with built-in PoE functionality for powering CCTV cameras, Wi-Fi access points and Airmux radios, as well as legacy serial protocols, and feature a comprehensive cyber security suite. RAD’s Airmux-5000 enables reliable point-to-multipoint and broadband mobility communications between stationary personnel and vehicles moving at speeds of up to 200 kph (124 mph). Communications of this type connect security staff, O&M teams and first responders with up to 50ms handover between base stations for uninterrupted video transmission. Airumx-5000 features smart antenna technology, including beamforming, nLOS/NLOS and MIMO to deliver high throughput, long-range coverage and robust connectivity – even at remote facilities and over difficult terrain. The RADview management and orchestration system provides easy planning, configuration and monitoring of the network and RAD devices, offering an intuitive user interface and automated operations. PacketLight solutions are ideal for a variety of vertical markets, such as carriers, ISPs, dark fiber providers, data centers, storage facilities, utility companies (railway and power companies), and financial institutions. 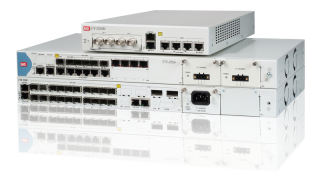 The wide range of PacketLight xWDM and dark fiber solutions includes multi-rate sub-10G CWDM/DWDM platforms, 10G CWDM/DWDM and 100G solutions with built-in OTN options, muxponders, amplification and booster solutions, WSS-based ROADMs, 10 x 1-GbE muxponders, and passive multiplexing solutions.